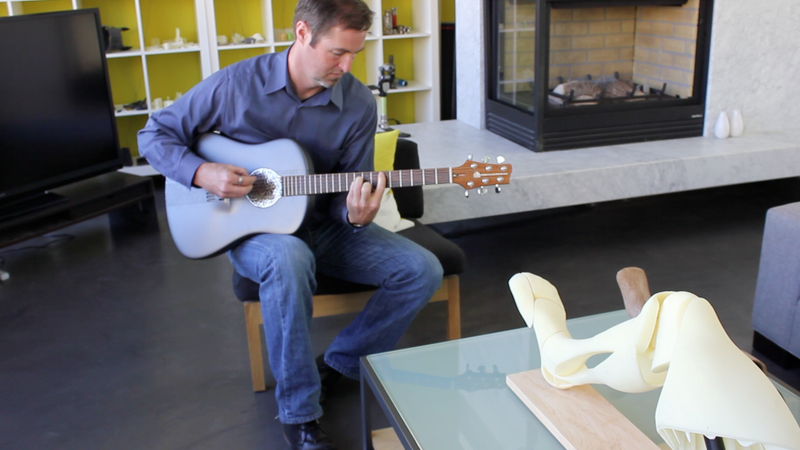 South of Market in San Francisco, industrial designer Scott Summitt, is blurring the line between medical devices and sculpture. He calls what he’s making the Fairing. The word fairing typically describes the covering on a motorcycle – the curved shiny part that makes it a sleek, aerodynamic machine. 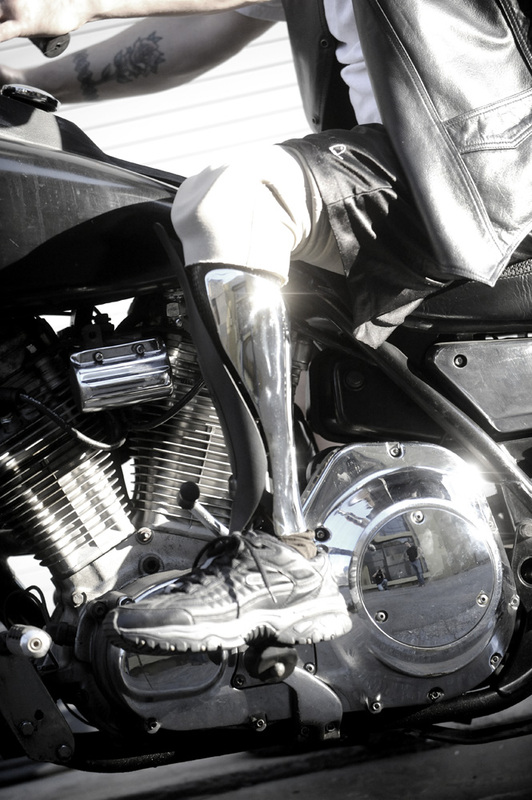 Scott Summit, Director of technology at Bespoke Innovations 3D Systems is pushing the definition—his fairings are for people with prosthetic limbs. 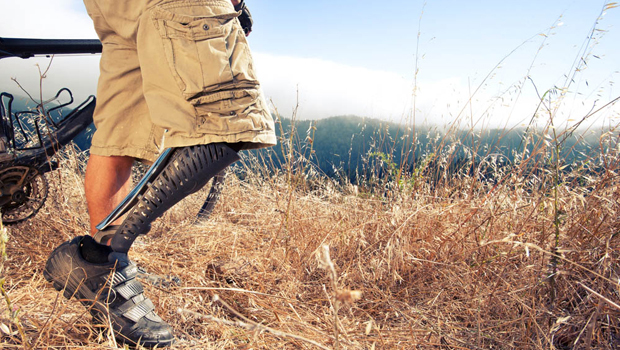 “Typically a prosthetic limb is a very mechanically designed thing. Hardware, exposed nuts and bolts, titanium tube, carbon fiber foot,” says Scott who has designed for Apple, Nike and other Silicon Valley companies. Scott and the designers at Bespoke work individually with each person to customize and develop the look of the fairing. Leather, chrome, heavy-duty dishwasher safe plastic – simple or patterned. Some people choose plaid, or snakeskin, or a tattoo. The back covering of Sarah Reinertsen’s fairing is a see- through herringbone design dipped in chrome. The idea came to Scott about twenty years ago when he saw Aimee Mullins at a conference talking about being an amputee and how that shaped the way she goes about her life. Amy showed the audience her sprinting legs made of carbon graphite and the legs she uses for tennis and softball that have shock absorbers in them. “Here’s this lovely woman,” Scott remembers, “ but she had these legs that were looking so mechanical. And I thought, ‘Wow, why did nobody step up to the plate and make something as sculptural and fluid as the rest of her.’” Scott realized that a major obstacle was the difficulty and expense of producing a custom device per person. The first step in making a fairing is to scan the person’s “sound side” leg using image-based 3D scanning technology. This takes less than a minute. A 3D computer model is mirrored and superimposed over the prosthetic post. Scott explains that the term 3D printing, is a metaphor. It’s not printing anything in the traditional sense of what printing is. A 3D computer model is sent to the printer and the computer inside this machine slices it up into very thin cross sectional slices. A laser, or an electron beam, or a nozzle creates one layer after another after another. A range of materials can be used–plastics, nylon, metal, ceramics. We walk around the Bespoke 3D Systems loft office looking at tiny plastic robots, gadgets and gizmos – all 3D printed. Small printers, about the size of coffee makers whiz and whirr layering and layering brightly colored plastic. Scott picks up a guitar and begins to tune it. “This guitar was entirely 3 D printed—the body, the sterling silver on the badge, even the stainless steel plate on the neck. “I grew up down the peninsula,” says Scott. “My dad was one of the Silicon Valley early guys. He and his collaborators were explorers. They had these new tools—data bases, boolean searches, ascii text files, and the modem – this idea that you can transfer information over a telephone line, a crazy idea. That was exciting to see as a kid, this idea that anything is possible.